This blog and video are the fifth in a series we’ve put together to answer YOUR questions! Mistake #5 that artists make is: Not understanding their audience. In other words: Why does an audience go to a show? What do they pay attention to? Do they pay attention to the music? The lyrics? The person? The melody or the groove? YES! All of the above. But what you want to do is point out those things at specific times. So many artists have a pretty cool groove, but the audience doesn’t know it’s there cause everything else is over it. But, if you start the song with it and get everyone into the groove and strip it down to where it’s just the groove to start, THEN we bring the song in and now we’ve captured everyone. Now everyone loves a groove, and everyone loves a great melody, something that’s memorable and that you can sing-a-long to. Not everyone is a big lyric fan. I hate to say it, it’s not all about the lyrics all the time. Are lyrics important? Absolutely. But live, how many of you can actually hear the lyrics, depending on the venue? So what is it that people are paying attention to when they watch you? What kind of person are you onstage? Have you created space in your show by rearranging your song so your personality can come out? So many times when we work with an artist the song is in control, not the artist. What I mean is this: on radio you need a short intro so that it can be played. Well, live, we don’t need to do this. Live we need to develop the intro. There’s a reason it’s called the intro. We are trying to capture and engage these folks to pay attention to the song, the melody, and the lyrics. So how do we do that with a real quick intro? It makes no sense. Amy: Have you seen Bohemian Rhapsody yet? Well it shows Brian May saying, “I wanna make the audience part of our shows.”, and he brought the guys in and started a groove. And out of that is what became ‘We Will Rock You’. It exploded and everybody knows it and it has become so identifiable. 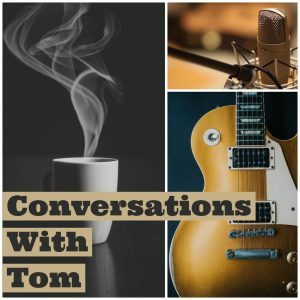 Tom: But if you’re an indie artist and you started with that groove… they still would know! And let’s pretend that (song) never happened. They would still be pulled into that groove. Amy: And that goes back to audience psychology; understanding that they want to be a part of what you are doing on the stage. Tom: What do they pay attention to folks? What you have to do is point that out. It’s like having a meal. You have your main course which might be your lyrics, your energy, whatever your strength is. But just because it’s your strength does not mean you want to keep beating people over the head with it. Cause not everyone likes only what your strength is. Some people go to the salad, some go to the bread. And when you go to those things… point them out! If it’s always about ‘the song’ you’re in trouble. People have to experience the melody and the rhythm too. When you’re doing a festival for instance, it’s hard. Particularly if you’re an indie artist and you don’t have the lights to draw attention to what’s on the stage… start with a groove. Once the groove starts, people will get hooked and it will draw them into the song. Then you can give them lyrics; then you can give them a cool voice; then you can give them cool music. But if you don’t draw them in you’re in trouble. Even if you don’t have a great voice, you can still pull people in with other things, because your main course is something different.